Chicken is a favorite protein to cook with since there are so many ways to prepare it. There never seems to be a shortage of chicken recipes and I'm always happy to try new ones to test out. This recipe for Roman Style Chicken was delicious in the Instant Pot! 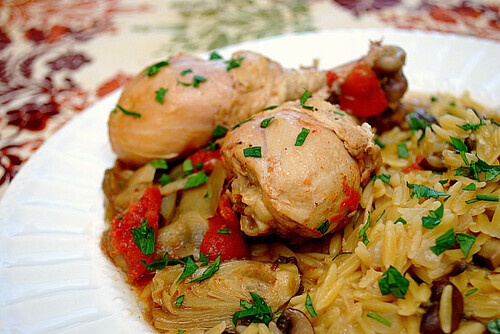 Bone-in chicken is browned and then braised with bell peppers, bacon, garlic, tomatoes and wine. To finish it off, salty capers and fresh Italian parsley are tossed in to add some bright notes to the rich, pressure-cooked flavors. This chicken recipe comes from Giada De Laurentiis and it was a pretty popular one on the Food Network site. It rated pretty high and it's no wonder - it really is good! I added artichoke hearts to the dish for another dimension of flavor and it worked nicely with the other ingredients. This dish was served with caramelized cremini orzo and a light green salad. If you don't have an Instant Pot, you can get the slow cooker/crockpot recipe version here! Season the chicken with 1/2 teaspoon salt, 1/2 teaspoon pepper and 1/2 teaspoon garlic powder. Press SAUTE on the IP and add the olive oil. When the oil is hot, cook the chicken until browned on both sides. Remove from the pan and set aside. In the now empty IP, add the peppers and bacon and cook until the peppers have browned and the bacon is crisp, about 5 minutes. Add the garlic and cook for 1 minute or until fragrant. Add the chicken back to the pot with the artichokes, tomatoes, wine, and herbs. Using a wooden spoon, scrape the browned bits off the bottom of the pan. When the IP beeps after pressure cooking for 7 minutes, allow your IP to naturally release pressure for 5 minutes. While naturally releasing pressure (also known as NPR or NR), the display will reflect numbers counting up from 1. The numbers indicate how many minutes the IP has stopped cooking since it beeped (or how many minutes it has been naturally releasing pressure). No need to touch your IP while it naturally releases pressure. The pin at the top of your IP will drop when all pressure has been released and it's safe to open. When the display reflects 5:00 (which is 5 minutes since the IP has beeped) all pressure should have naturally released. If not, turn the setting on top of your IP to VENTING. Doing so allows the IP to quickly release any remaining pressure (also known as QPR or QR). I use a wooden spoon to carefully turn the setting to avoid close contact with the potential steam. You may also want to turn your IP away from cabinets to allow the released steam to escape freely. The pin at the top of your IP will drop when all pressure has been released and it's safe to open. Just before serving, add the capers and parsley; stir to combine and serve. I could be blind but I did not see where to add the chicken back in.